I've bought simple stories mix & match album and recently I did a little "artpiece" to go in one of the 4x6 page protectors. 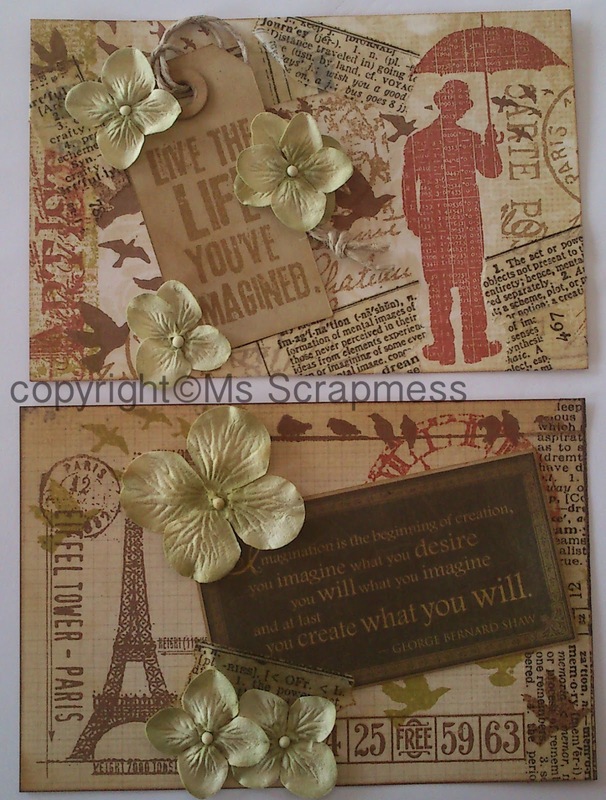 I entered that piece in simon says stamp vintage challenge what do you say and as a personal challenge I decided to make another one to match. I used the same paper from simple stories, but the other side from the first piece. For the first piece I had a quote in mind, but never used it as I didn't want to cover the background. I went a bit overload with the stamps - LOL! So for this piece, I tried to keep it simle. I used the same stamp sets, but didn't want to use exactly the same stamps. Although, I can't not use the birds - love that stamp! I put them more in the background though, as they were more in focus the last time. My goal was then to make the new piece the opposite from the first on. So the tissue tape is put vertical as suppose to more horisontal, it's on the right side compared to the stamped journey definition on the left at the first piece. Then I sort of lost the concept I believe, but I didn't notice until I compared the two and by then it was to late. As there was still time on SSS challenge left, I entered this piece as well. 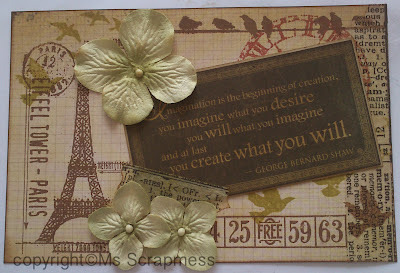 The quote is a tag from G45 paper pad kraft reflections. Thanks for hanging on to my ramblings - LOL! Have a great day and may inspiration come to all of you!!! Lovely piece with a great vintage feel. I love your colour scheme of faded autumnal tones. Thanks so much for joining us for this week's Simon Says Stamp and Show Challenge!